Hilary Westerfield can tread water for 37 minutes. She ties knots better than any of the sailors in her father's navy fleet. Plus, she owns a rather pointy sword. Hilary wants nothing more than to be a pirate. 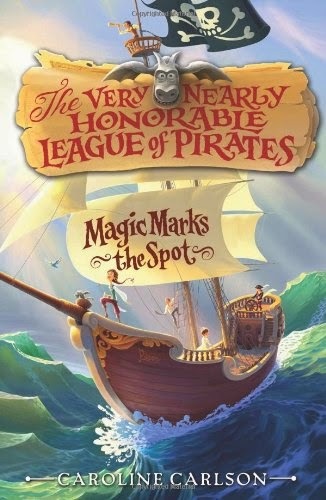 However, the Very Nearly Honorable League of Pirates, or VNHLP, does not allow girls to become members. Especially little ones. So Hilary takes it upon herself to escape finishing school, find her own crew, and go after the magical treasure herself--scallywags and scourges be warned. I laughed out loud so many times during this book, I'm sure I came off rather strange to those around me. But I couldn't help it. This book is so witty, snarky, and just plain hilarious. With a classic storytelling attitude, Carlson turns the world of piracy on its head and turns out a magnificent adventure tale. The characters are endearing, the story was unpredictable (as is the case when being hilarious), and I highly recommend it.